Apple Music was recently rolled out to several countries across the world, with a 3-month free trial. And being a music streaming service from Apple, many users have been willing to try it out. But, if you want to discontinue your Apple Music subscription for some reason, you need to manually opt out from the service in order to prevent getting charged at the end of the trial period. In this article, we’ll explore how to disable auto-renewal and cancel Apple Music subscription from Mac, PC and iOS devices. By default, after the initial 3-month trial period ends, Apple will automatically charge the monthly subscription amount from your credit card in order to renew the Apple Music subscription. If you don’t want to use the service anymore, you must ensure that auto-renewal is turned off for Apple Music. Click on your name on the top right side and choose Account Info from the drop-down. You may be asked to enter your Apple account password. On the Account Information page, scroll down to the Settings section and click Manage on the right side of Subscriptions. Turn off Auto-Renewal under Renewal Options of your Apple Music Membership. You will now no longer be billed automatically for Apple Music. Tap on your Apple ID. If you’re not signed in, do so with your Apple ID and password. Tap on View Apple ID. You might be asked to enter your Apple account password. 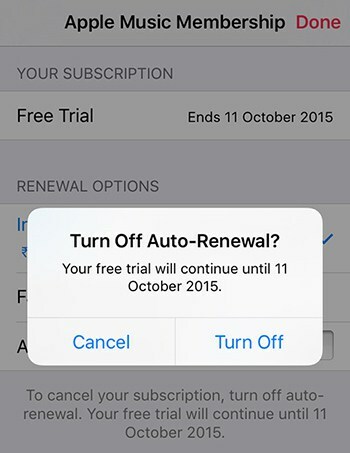 Turn off Automatic Renewal under Renewal Options, for Apple Music Membership. Once you have turned off auto-renewal option, your Apple Music subscription will automatically be cancelled once the free trial is over. If you change your mind anytime, you can resume the use of Apple Music by accessing your Account Information page and choosing a suitable renewal plan from the Renewal Options. iTunes will charge the selected subscription amount and your subscription will be renewed. Hope this article was useful for you. Share your opinions about it in the comments below.